Moccasins can be worn with a number of different outfits and styles of clothing within your wardrobe. They are the perfect footwear to easily dress up or dress down what you are wearing depending on the look you are going for. Moccasins are extremely comfortable and stylish and have been worn for many years so you don’t have to worry about them going out of style. They come in a variety of different styles such as slippers, loafers, shoes, or boots that cover a variety of uses and seasons for both for indoor and/or outdoors. Men’s moccasin loafers are a leather shoe with or loafer with a low flat heel. Moccasin shoes or loafers can be worn with or without socks which makes them a year around shoe. Men’s moccasin loafers can be worn with pants, jeans, capris or shorts and are more likely to be worn for a comfortable and casual look. They can be worn inside or outside and are perfect for a house shoe or slipper as well as for doing casual activities. Men’s rubber sole moccasin shoes are also known as driving moccasins. They are a contemporary version of the traditional Native American moccasin with a rubber sole. Driving moccasins are a lightweight versions that usually have a partial sole or full reliable nub grip that curl around the heel to be comfortable when driving. These moccasins can also be worn with pants, jeans, capris or shorts. Driving moccasins will go nicely with your sweats or a blazer so they will coordinate with almost anything in your wardrobe. Men’s moccasin boots come in several different styles with different features. They can be ankle high, mid calf or knee high in height and may have a fringe and laces. 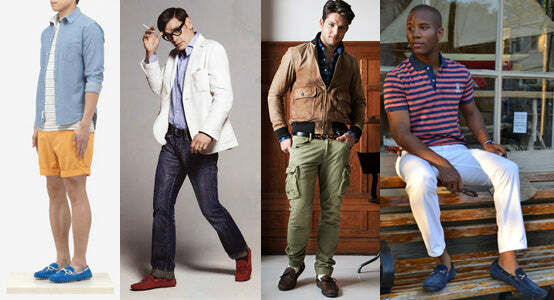 Men’s moccasin boots can be worn with pants, jeans, capris or even shorts if you’d like. Their natural leather and suede colors make for a subtle but distinct look. The option of fringes and laces give them an extra stylish touch. Women’s moccasin come in a variety of shapes, styles and colors. They go great with any casual outfit or you can wear them with a skirt or simple dress. For example, deerskin ballet slippers have a soft sole and are perfect to wear as a slipper at home or will look cute with a dress if you are going to a neighbors garden party. Moccasin slippers will go with absolutely anything, but are mostly meant for indoor use. Women’s rubber sole moccasins offer the same comfort and look as the traditional slippers but are more versatile. The rubber padded sole makes these moccasins versatile and great for wearing outdoors. Moccasin shoes may have fringes and/or beading which tend to dress up your outfit so they can be worn with a dress or a skirt. They also look stylish when worn with pants, capris, shorts or skinny jeans. Women’s moccasin boots can be worn indoors or outside. They come in different sizes such as lace-up knee high, mid-calf or ankle high with a fringe. There are also trendy accent options such as Native American beading, leather laces and double hand-sown vamp. Moccasin boots look quite fashionable with skinny jeans but can be worn with anything from dresses to shorts. Moccasins look great on the whole family. They have been the traditional footwear of Native Americans for years and are still the best shoe choice for today. At Leather Moccasins we offer a large selection of authentic Canadian handmade moccasin slippers, shoes and boots to meet all your family’s needs. Enjoy sporting the latest fashion by combining your new moccasin footwear, with anything in your wardrobe, and check out our selection today!